Purchasing software can be incredibly complex. With bundling packages and vendor mergers and acquisitions it can be tough to keep track of. This is by design. Software vendors make a lot of their revenue from licensing fees that are difficult to anticipate. Don't let your organization get caught up with these. 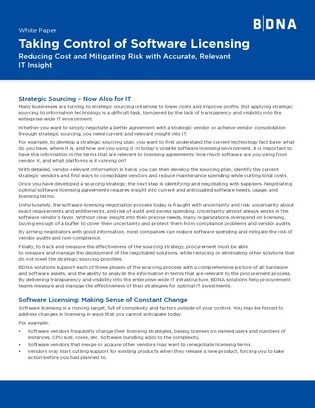 In this white paper, learn how to take control of your software licensing. Discover tips for identifying strategic vendors, negotiating with them, and enforcing sourcing strategies over time.